The adorableness is off the charts here as a mama bear and two of her cubs take a detour through a Pasadena neighborhood and decide to take a dip in a family’s swimming pool before making their way back to the forest, KTLA reports. Clearly having a great time splashing around, these bears don’t seem to have a care in the world as they cool off on a hot day. 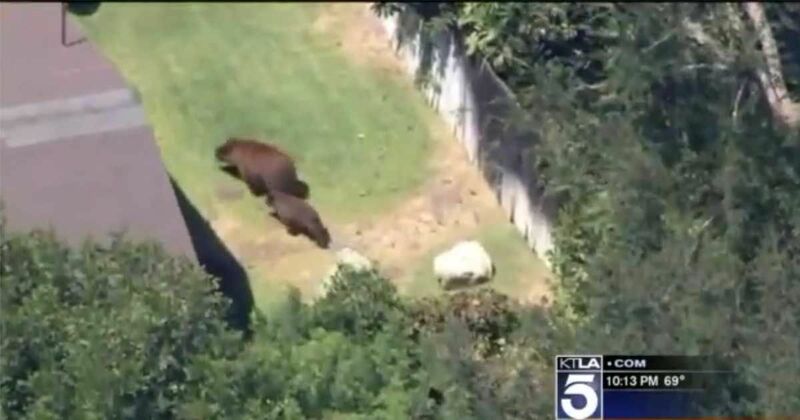 The Pasadena authorities indicated they started receiving phone calls about the trio around noon after one of the bears may have inadvertently bumped into and broken a sliding glass door in the back of the home. However, they did not enter the home. The bears’ leisurely swim was interrupted by the family dog, who scared the bears away. The bears then made their way to a nearby dumpster, presumably in search of a tasty treat. According to what Andrew Hughnan, a spokesman for the California Department of Fish and Wildlife, told KTLA, it is not unusual to see bear activity in the area, but it is unusual to see them in the swimming pool. Hughan speculated that the mama bear weighed around three hundred pounds, and her two cubs were estimated to be around a year old and appeared healthy. The Sheriff’s Department coordinated with the Department of Fish and Wildlife to track the bears’ movement and reported later in the afternoon that the bears were safely up in a tree. Around mid-day, the Sheriff’s Department confirmed the bears had retreated safely to the forest, likely worn out from their big day of adventure within the city. You can see them having fun in the video below. SHARE if you like it!